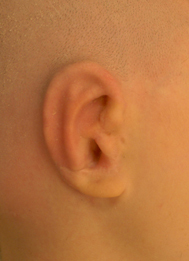 The ear remnant is used to make the new earlobe and the other cartilage remnants are removed. The cartilage framework is templated on the unaffected side and is implanted beneath the skin which conforms to the shape by means of a bloster dressing that remains in place for a week or two. 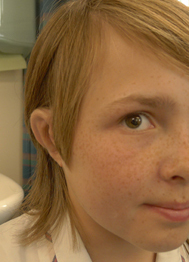 At the end of this process there is an ear that is ‘stuck’ to the side of the head. This first operation takes six or more hours because carving the framework is a meticulous process. A hospital stay is advised until the chest is comfortable. To achieve a good ear requires a high-relief framework and thin skin, but the thinner the skin the more tenuous the blood supply. For this reason there is a possibility of complications relating to blood supply of the skin. If the skin has poor blood supply it can fail to heal and an infection can establish itself around the cartilage. For this reason a lot of care is required in the postoperative period and regular dressing changes and checks are required. Occasionally a second unscheduled operation will be required to prevent a problem. If all is well the stitches and dressings will be removed at seven to ten days and the ear will now look somewhat swollen. Over time the swelling and definition improves. 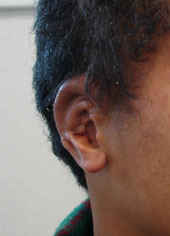 After approximately six months a second operation is performed to elevate the new ear and project it away from the head. Half of the head is shaved. The perimeter of the ear is incised and the ear elevated away from the head. 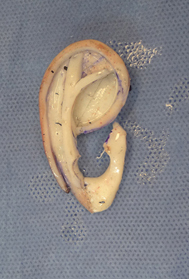 A further piece of cartilage is harvested from the chest using either a piece saved from the previous operation or a piece of the reformed cartilage, and this cartilage is used to prop the ear forward. 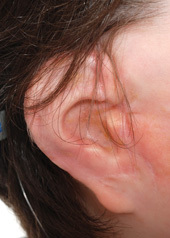 A thin layer of tissue (fascia) is taken from beneath the hairbearing scalp and folded over to cover the cartilage prop so that a skin graft can be applied behind the ear. The skin graft is taken from the scalp or from the groin. 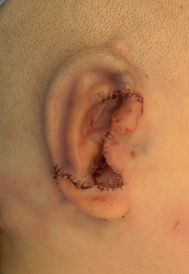 A dressing is stitched in behind the ear and a head bandage applied. The patient can usually go home after 24-48 hours. After a week the graft is checked and regular dressings will be required for several weeks. The ear always loses some definition after the elevation process and time is required for this to gradually improve again. 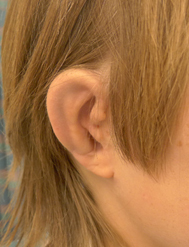 Although many ears will look good within a few weeks experience has taught us that it may be up to as long as two years before all of the thickening and swelling settles and the final result is evident. Some examples can be viewed below. 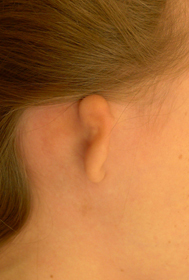 At the end of the day it is possible to produce an ear that mimics the unaffected side but will never have quite the fine detail of a natural ear. There is a range of outcomes and if there are small problems during the process this may affect the final outcome. Occasionally there is an area of hairbearing tissue left on the rim of the ear that requires removal as a separate procedure. The ear is long lasting and durable but should be protected for contact sport. Although this surgery can be performed from ten years of age many children are not psychologically ready for a big operation and hospital stay at that age. We will often leave the surgery until the child is ready as there is no time limit.